Welcome to Engineering Explorer Post 1882 & Club 42's website. Explorer Post 1882/Club 42 is a Learning For Life Engineering and Technology Explorer Post & Club in Prince William County Virginia. We explore a variety of fields in Engineering and Computer Sciences in order to help young adults make educated decisions on future career possibilities. We also engage in competitive robotic challenges, take field trips to area employers and facilities, and provide STEM community outreach programs. Since 2014 Explorer Post 1882 has fielded VEX Robotics teams, a Zero Robotics team, MATE Underwater ROV teams, CyberPatriot teams and a TARC rocketry team. 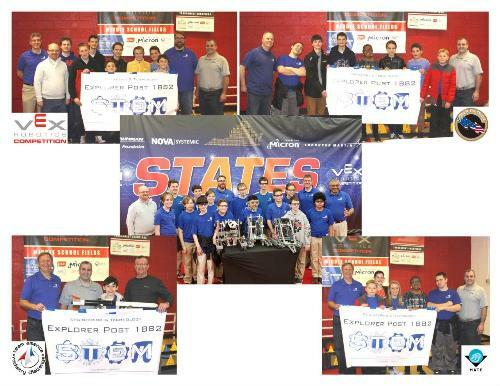 The Explorer Post has hosted over 10 regional VEX Robotics tournaments, a STEM Camporee (500+ participants), STEM summer camps and showcased engineering in the HayMaker STEM Expo (2000+ attendees), Joe Gibbs Country Fair and Celebrate Fairfax. The Explorers have also led numerous STEM Outreach activities for local Boy & Girl Scout troops and participated the Virginia STAR program, refurbishing PCs for students without computers. Most recently the Explorer Post help launch the first makerspace in Prince William County - Sally's STEM Shack at the BSA Camp William B. Snyder. The Explorer Post has also ventured out on numerous field trips and engineering sessions including the Tech Shop, DARPA, NAVSEA Cadderock, Micron, 3D Printers, Electrical Circuits, Model Airplanes, Sky Robotics, Discover Scuba, and NASA. The Explorer Post is now 24 Explorers and 10 Adult Leaders strong. If you know of a young adult in middle or high school who may be interested in learning more about engineering or about a future in engineering - our program will help expose and excite them about the range of possibilities. From Civil to Electrical to Chemical to Mechanical to Computer to Environmental - almost every problem can be dealt with by some branch of the engineering sciences. Join us today! The Post/Club is extremely fortunate to have several of the region's leading STEM organizations as participating organizations/sponsors. We could not provide the program we do without their support.